Designed for especially heavy workpieces such as those found in mill roll manufacturing and rebuilding. Two stage/ 5 point testing of nose level, vibration, tempurature, and accuracy under load. 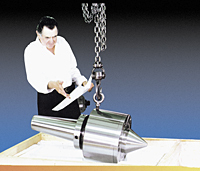 Applications requiring bearing load ratings from 120,000 to 450,000 lbs are available. High capacity, three-bearing live centers designed especially for the high loads, high removal rates, and close tolerance requirements of mill roll manufacturing and rebuilding. Handle loads of 62,000 lbs. and larger.